DRIVER’S PERMIT ATTENDANCE VERIFICATION Required, for a student to get a Driver’s Permit! Students may pick up a form in the front office during regular office hours. Please have student Social Security Number to complete the form. ADMISSIONS - Applications are still being accepted for 2019-20. 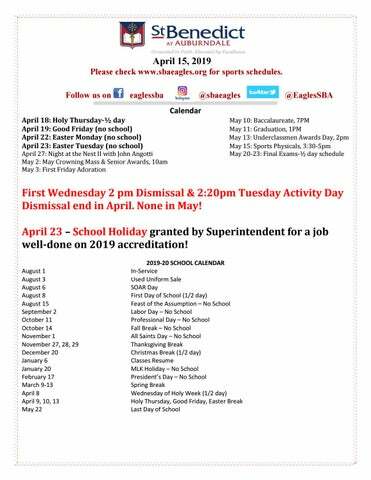 Please visit our website at www.sbaeagles.org/admissions for procedures and application. LOOKING FOR VOLUNTEERS FOR THIS FUN EVENT! Interested in helping? Contact Matt Stark at starkm@sbaeagles.org or 260-2892 We are seeking volunteers and sponsors to assist in making Night at the Nest a night to remember. Volunteers are needed for the following committees: auction items, decorations, event set-up, tickets. Inquiries about volunteer and leadership team needs for the upcoming school year, please email sbahomeandschool@gmail.com. Looking Ahead to the New School Year: Consider Volunteering with Home & School SBA’s Home & School Association is able to serve our school’s families, faculty and staff through the work of many volunteers. At the end of the current school year, we’ll be saying goodbye to a number of parents who have been valuable members of our volunteer team for a number of years—making this a great time for new parents to get involved! If you would like to know more about Home & School and the organization’s various volunteer needs, the next group meeting will provide a perfect opportunity to get more information. BE SURE TO SEE INFORMATION IN THIS MONDAY MAIL ABOUT USED UNIFORM SALE! Ready to clear out that closet to make room for college gear? Donate your SBA uniforms. After your last final, you can donate your SBA uniforms to SBA Home & School. There will be a collection box near the front office. Please No stained or torn items. WE WILL HAVE GIFT CARD DRAWINGS FOR STUDENTS WHO DONATE THEIR UNIFORMS! 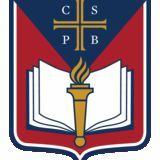 The SBA Used Uniform Sale is August 3, 2019. If you want to make a little extra money, you can follow the instructions on the next 2 pages. Complete the inventory form, put CLEAN uniforms, in good condition on hangers with price tags attached. Drop them off on Friday, August 2. Pick up money and any unsold items Any unwanted items can be donated to Home and School Any unsold items and / or money not picked up by 4:00 on August 3 will be donated to Home and School ** The sale will be held in the Rotunda foyer area outside the school office. We cannot be responsible for loss due to fire, theft, etc. Please remember that every item must be on a hanger and have a tag secured with SAFETY PINS. Place tag on left side of the item.